I wanted to update Scorpio RC4, (formerly installed to a Dell tower, Pentium IV with 1 GB ram) which I did, then realized I had half of the update using Jessie/SID. How did I achieve this? I guess I have been too fast reconfiguring the sources.list. just I didn't edit /boot/grub/grub.cfg but the file /etc/grub.d/40_custom which is meant for custom entries, and once done I invoked as root "update-grub2". 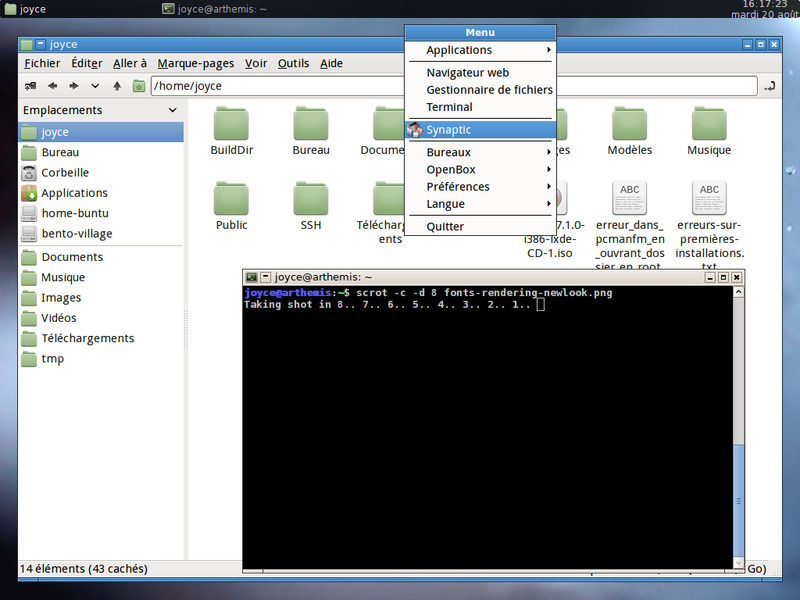 because instead of ending with LXDE I ended with… Gnome3 ! Which I didn't like, so I had to work some more time after the install to correct this. I wonder if the grub2 text block allows adding options to the linux command line? The post install steps have been, installing Lxde because I wanted to escape Gnome 3 as fast as possible, (just Lxde core, because "task lxde" or such installs a world of programs I wouldn't need) then login to Lxde, remove all possible Gnome components and trying not to break the system while doing so, then install the additional packages and configuration which I keep at http://meets.free.fr/Downloads, in directories which are now more and more structured to find easily all the setups and changes done previously in the different Ubuntu Openbox spins. (It's a work in progress). The LXDE main components are gone, the icons are Faenza with Faenza Mint on the top, providing a nice green set of icons. There is one issue left: the fonts are ugly, and this will be some work to make them look smooth as they usually are in a Lubuntu, a Xubuntu (and I would suppose in the official Ubuntu as well, which I very seldom boot so I don't quite remember). Fonts! How to make them look consistent with the right thickness and smoothing? I started working on it, and I plan to read again the archlinux wiki howto on this one, for it has helped before. My fear is I think the components needed might not be available in the Debian current repositories. system wide, if, nothing interferes with them later. I like Droid Sans Bold 12 also. If you just wanted a bare minimum LXDE desktop Debian 7 installation, you could have saved some time and aggravation by using this one. You can copy the iso to a USB and boot from it. I suspect the poor man method will work just as well. The sources are already Debian stable. You'd just need to run updates after installation. I didn't know about the option 'gtk-auto-mnemonics=1'. I am not sure yet to know what is it's use. djohnston, I need to start from an official install to work on learning how to create packages. At same time I am re discovering methods I used before but didn't quite remember. Else, I would like to solve the mystery around the font issues. It seems that Gnome environments avoid the problem thanks to the gnome-settings-daemon package, but I don't know what it does. In Archlinux, I have been able to reduce greatly the issue by installing the Ubuntu patched packages provided with the AUR system. I have read a wiki at debian-facile.org, but the LMDE packages suggested were not available anymore, so I went to the LDMD chan and got help from someone who directed me straight to the Ubuntu packages. After trials and errors I ended installing 2 packages from the Raring repository, after I checked the versions of the depends could match. (I did a chattr +i as root on it, because Lxappearance changes it each time I want to reconfigure only the gtkrc-2.0). (depending on the monitor, and following the Arch wiki, as preceding and not repeating all the configuration already included in the ~/.fonts.conf file). I am quite satisfied about the result, and will work with it with enough comfort and hopefully pleasure. Some might object that installing some packages from Ubuntu is not good, so I am not sure it could fit in a tips and tricks. What do you think? the full list once. The ones there seem adequate however. one extra one, very optional, never had "lines" on the menu.